This Pain au Romarin, or Rosemary bread, is one of my favorite sourdough breads. 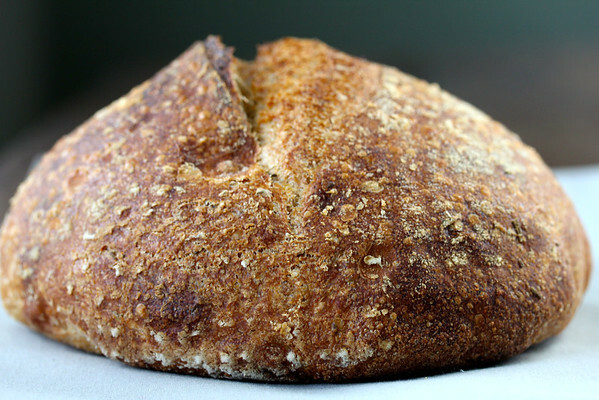 It has a pleasantly faint sourdough flavor, and has a chewy and crunchy crust. 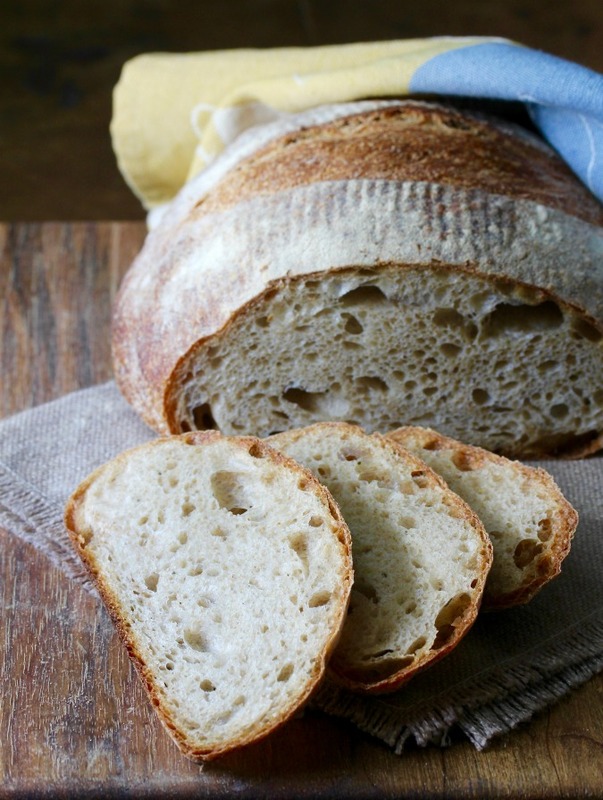 It's probably one of my favorite go-to sourdough recipes. The recipe is pretty flexible, in that, once you have shaped your loaves, you can bake the bread the same day, or let the loaves slowly rise for up to 18 hours in the refrigerator prior to baking. 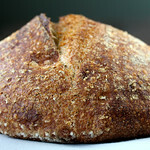 The levain (starter) can also be refrigerated a day or two after it has been mixed and allowed to ferment. When this Pain au Romarin is baking, your whole house will have an amazing aroma wafting through it. The bread is so moist and flavorful. It is excellent with butter, and incredible toasted. 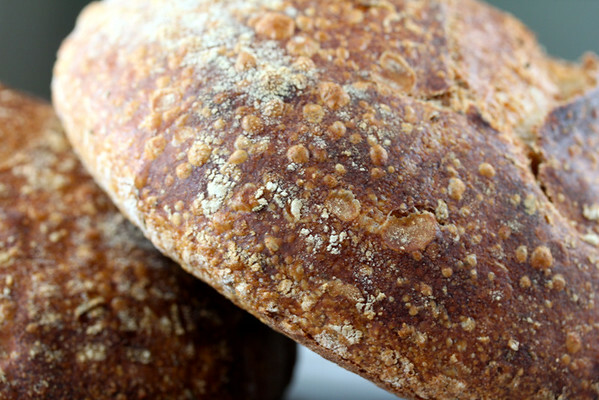 While there is a decent amount of whole wheat flour, it does not dominate. The night before baking day, feed your starter to create the levain. 9:00 am: Mix, autolyse, knead, and ferment your dough. 12:30 pm (approximately): Shape the loaves. 2:30 pm: Bake the loaves. 7:00 am: feed your starter to create the levain. 6:00 pm: Mix, autolyse, knead, and ferment your dough. 9:30 pm: Shape the loaves and refrigerate. 6:00 pm: Remove the loaves from the refrigerator and preheat the oven. 7:00 pm: Bake the loaves. These schedules are given as guidelines, and can be customized based on your own schedule. The original recipe calls for 28 grams of finely chopped fresh rosemary, which is quite a bit (about 1/2 cup). I cut it back to about 17 grams, and the loaves were still very aromatic. If you want big rosemary flavor, definitely go for it. 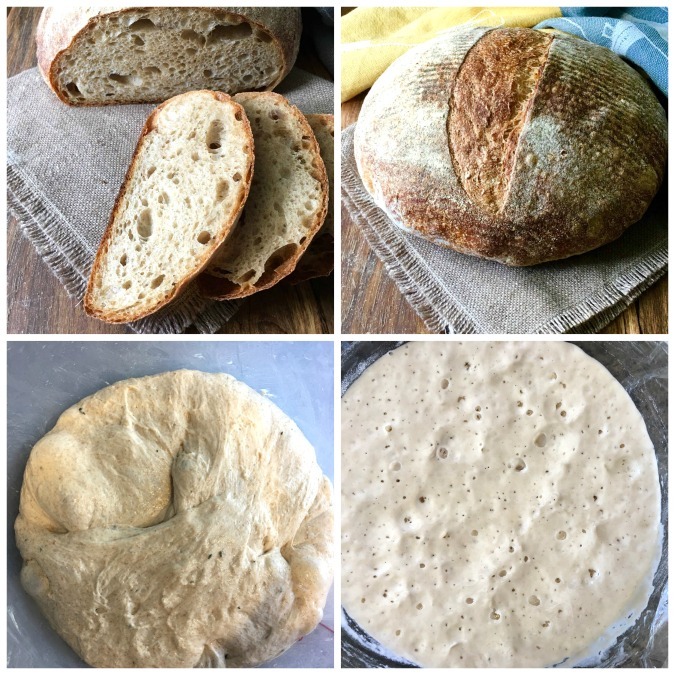 The loaf above was made using the one day method, and the loaf in the photos below was made using the two day, cold fermentation method. One of things I love about cold fermented bread is the resulting bubbly crust. This formula for this bread was given to me by my breadhead friend David of Hearth Baked Tunes. It was inspired with permission by the book From the Wood Fired Oven by Richard Miscovich. The author/baker always bakes a sprig of rosemary into the bottom of the loaves. How cool is that? Mix the levain ingredients in a medium bowl, cover with plastic wrap, and let sit at room temperature for 8 hours. 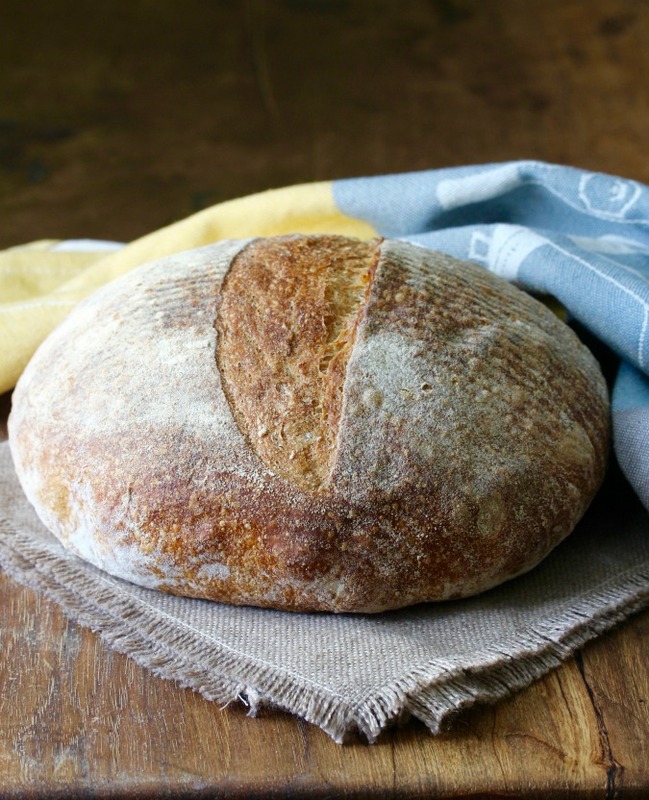 At this point, you can either use the levain immediately, or refrigerate it up to 24 hours. In the bowl of a stand mixer, mix all of the ingredients except the salt and rosemary. Let sit for 30 minutes (autolyse). Add the salt and rosemary, and knead with the dough hook for about 8 minutes. Place the dough into an oiled bowl and let it rise for about 2 1/2 hours, folding the dough four times at 30 minute intervals. When the dough has doubled in size, gently pull it out onto a lightly floured work surface. Cut the dough in half with a bench scraper, and shape each half into a ball. Cover with oiled plastic wrap and let sit for about 10 minutes. Dust two bannetons with flour, or line two 9 inch bowls with floured tea towels. Shape the boules a second time, creating a taut "skin" on the outside of the dough. Place the dough, seam side up, into each basket. Cover with oiled plastic wrap, and let rise at room temperature, for about 2 hours, until puffy. Alternatively, refrigerate the dough for about 18 hours. Place two Dutch ovens in the oven and preheat it to 500 degrees F (If you only have one Dutch oven, bake one loaf at a time). Remove the hot Dutch ovens and place the dough, seam side down, into them. Slash the loaves with a lame or sharp knife, cover, and place back into the oven. Reduce the oven temperature to 450 degrees F.
Bake for 25 minutes covered, and 15 to 20 minutes, uncovered. The interior temperature of the bread should be 205 to 210 degrees F.
Cool the loaves completely on a wire rack. There are so many breads I would love to make but do not have a stand mixer with a dough hook. I have a bread maker machine that could do the the kneading part for my right wrist is painful if I try to knead too much. Any suggestions for would love to make some of these wonderful breads? Cannot afford the price of a stand mixer for we are on a small retirement. Hi Joyce. You could use you bread machinr's knead cycle. I'm sure it would be great. Many of these loaves require just stretch and fold, which you could so with one hand. Please excuse me for commenting so late. This sounds really great, Karen. Because I'm relatively new to baking with natural starters, does the starter in the first part (for the levain) have to be ready to go and floating? Or is it the Levain that should be bubbly and floating on the day of mixing the actual bread? I would say that if your starter was fed within the last few days, then only worry about the levain. When I just remade this, I used starter that had been fed five days earlier. The more bubbly your starter is, the more reliable your results will be. Thank you, Karen. That makes sense. I was just re-reading the recipe and noticed "If you only have one Dutch oven, bake one loaf at a time" in step 10. We only have one Dutch oven but have successfully put together a reasonable compromise for the sencond one so we can bake two loaves at a time. We preheat a cast-iron frying pan and a large stainless steel mixing bowl, at the same time as preheating the Dutch oven. The two loaves end up being pretty much the same in loft. I use the stainless bowl all of the time with a baking stone. I've also used an upside down foil baking pan the same size of the stone. Works great with baguettes!